The Sak is commemorating the 10th anniversary of the September 11 terrorist attacks by donating a portion of sales from its patriotic Betty Sue collection to The Brooke Jackman Foundation. The foundation was established to honor one of 9/11's fallen heroes, a bond trader who was planning to move out of the world of finance to pursue her passion for helping children. Through the foundation Brooke's dream lives on. The group helps improve the literacy of New York City's underprivileged children by distributing thousands of Brooke's Books and Brooke Packs each year. It has donated almost 100, 000 books since its inception in 2001. That number is sure to increase with The Sak's help. 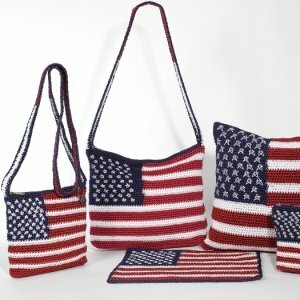 It is currently donating part of the proceeds from its crocheted Betty Sue bags. As The Sak is based in New York City, its co-founder Mark Talucci said "the events of 9/11 really hit home." In supporting The Brooke Jackman Foundation, The Sak can remember this time and give back to a very personal cause. The flag design is available on a cross-body bag, cosmetics case, Malboro shoulder bag, and even a pillow and placements! It doesn't cost much for us to lend our support, with Betty Sue items ranging from $17 to $39. They're currently available from The Sak's website.